Pirtek UK and Andrew Jordan have today confirmed a new deal that will take their long-standing partnership through until at least the end of the 2021 Dunlop MSA British Touring Car Championship. 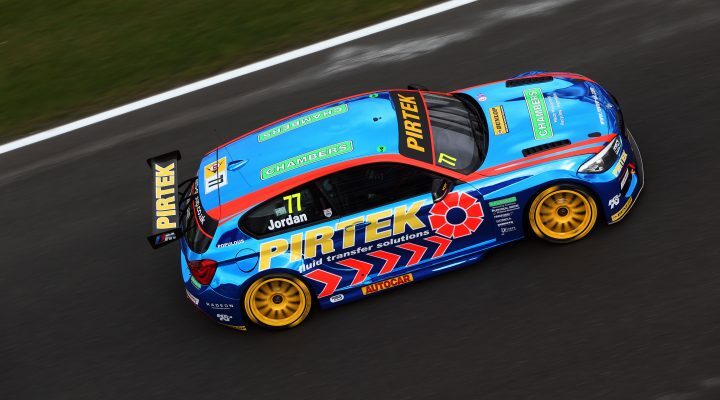 The new deal will come into play at the end of the 2018 season, and means Jordan will continue to compete in Britain’s premier racing series with headline backing from Pirtek for at least the next four years. The three-year extension will further strengthen a partnership between Pirtek and the Jordan family that has been in place for well over a decade, having initially started back in 2004 when Pirtek first supported Andrew’s father Mike in the British GT Championship. As Andrew embarked on his own career in Junior Rallycross, so his relationship with Pirtek grew, with Europe’s number one provider of fluid transfer solutions supporting him as he then moved into circuit racing in the Renault Clio Cup before debuting in the BTCC in 2008. Since then, he has gone on to establish himself as one of the top drivers in the series, with 19 wins, 57 podiums and a career total of more than 2000 points. He lifted the overall championship title in 2013 and has also clinched the Independents’ title on three separate occasions – in 2012, 2013 and 2016. AJ will once again compete with the championship-winning West Surrey Racing team this season in a BMW 125i M Sport, and his focus is firmly on challenging for Drivers’ honours for a second time. “I’m absolutely delighted to be able to extend my deal with Pirtek for another three years – particularly when we still have a year to run on our current deal,” he said. “Back when our deal with Pirtek first started, we couldn’t have imagined it would have become the long-term partnership it is now, and one of the longest-standing relationships in British motorsport. “What we have with Pirtek is much more than just a traditional sponsorship deal; we have a special relationship that has developed from working with [Marketing Manager] Tammie Argent-Peters and her team through the years, and that works for all parties involved. “That is something that I am extremely proud of, as relationships like that rarely come along. I’m looking forward to working with Tammie to explore new ways in which we can showcase our partnership – in both the BTCC and elsewhere – in the coming years. Pirtek UK MD, Chris Stuckey was also pleased to extend the current agreement: “The relationship with Andrew and the Jordan family has been a huge success for Pirtek and our many franchisees, and this new deal is testament to how strong our relationship is. “For well over a decade, Andrew has been a fantastic ambassador for the Pirtek brand, and the BTCC has provided our franchisees with unrivalled levels of exposure in front of an ever-expanding audience.